Celebrate Graduation with a Gift to UM. Pre-Order your UM Graduation Bear! To celebrate the Graduation Photo Taking Day in March and encourage the culture of giving back, the Alumni and Development Office has prepared the UM graduation bears for donation purpose. The minimum donation amount for each graduation bear and graduation hood are MOP120 and MOP20 respectively. If you wish to donate, please visit the ADO website (https://ado.um.edu.mo/) or send an email to donation@umac.mo and state the donation amount, graduation bear and hood’s quantity that you are interested in. We will confirm the donation with you through email once the email is received. 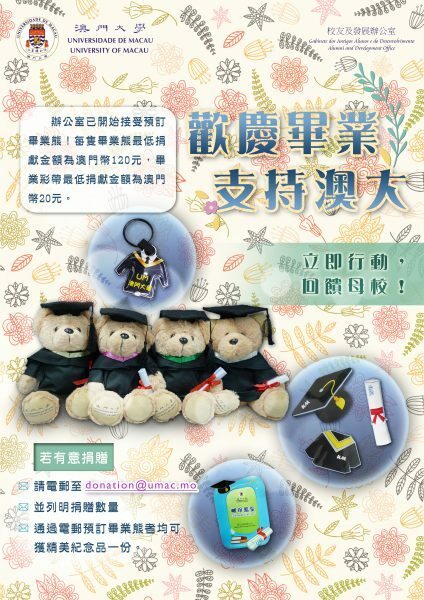 A free gift will be given to those who pre-order the graduation bear. Remarks: 8 colors of graduation hood for your choice: pink, silver, blue, lemon, red, orange, green and yellow.